Claudia Jones, the "mother of the Notting Hill Carnival" was a communist who spent her last years in London after being hounded out of the United States during the McCarthy witchhunts. Born in the British West Indian colony of Trinidad in 1915 her family emigrated to the black slums of Harlem, New York in 1922. She joined the youth movement of the Communist Party of the United States (CPUSA), the Young Communist League (YCL) in 1936 and soon became YCL organiser for Harlem. An active campaigner for black and womens' rights Claudia was a regular writer for the American Daily Worker and editor of the YCL's Weekly Review. She visited every state in the USA campaigning for civil rights, womens rights and peace and soon became a target for the anti-communist witchhunts of the 1940s. In 1948 she was jailed for "advocating the overthrow" of the American government and imprisoned again in 1951. Bailed out by the CPUSA she was jailed for a third time. Claudia appealed to the Supreme Court, which refused to hear it, and was eventually deported in 1955 on the grounds that she was not an American citizen. Racked by ill-health since childhood Claudia opted to come to Britain rather than Trinidad in the hope of better care. She joined the Communist Party of Great Britain (CPGB) and resumed active work amongst the growing Caribbean community in London launching and editing the West Indian Gazette. A year after the Notting Hill race riots of 1958 Claudia campaigned for integration and the promotion of Caribbean culture and was one of the founders and promoters of the Mardi Gras festival that has now become the Notting Hill Carnival -- the largest street festival in the whole of Europe. Struck down by heart disease and tuberculosis Claudia Jones died on Christmas Eve, 1964. 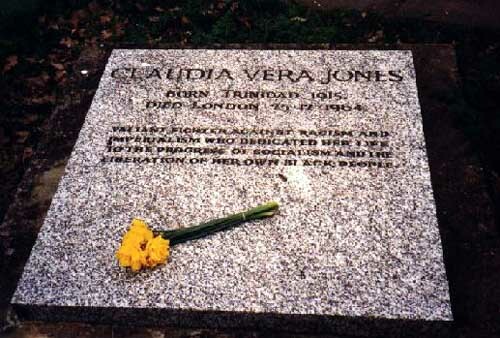 She is buried in a grave next to Karl Marx in Highgate Cemetery. The inscription reads "valiant fighter against racism and imperialism who dedicated her life to the progress of socialism and the liberation of her own black people".